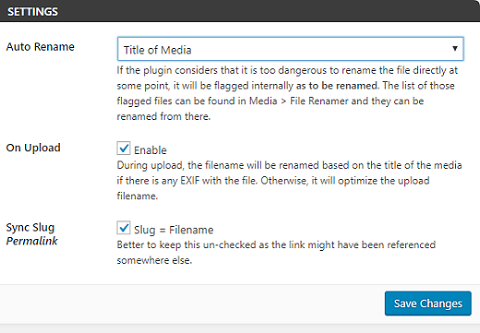 WordPress lacks the ability to rename uploaded media files. You can rename image title and alt text, but not the file name. I go through this situation several times and finally, found a plugin solution to automatically rename images on upload or from the media library. Install and activate Media File Renamer plugin first on your website. It is a simple plugin that automatically renames your media files on upload for better SEO. It changes the file name based on the image title and related data are also updated including posts, pages, custom post types, and metadata. After installation, open plugin settings to configure the operation. Select on Upload checkbox to automatically rename images on upload. Better to uncheck Slug Permalink checkbox as it may result in unexpected issues. Don’t forget to save changes. Visit Media > Renamer to rename already uploaded files in bulk or one by one. The plugin will replace your current file name with the desired file name as shown in the above screenshot. The bulk operation may take a long time depends on the number of images you have.